The California State University system has a strict set of guidelines that govern the awarding of honorary doctorates. The honoree must have achieved significant areas of human endeavor that embody the CSU’s objectives and ideals. Or, the honoree must have performed meritorious and outstanding service to the CSU. A third possible criterion is that the honoree’s life and achievements serve as examples of the CSU’s aspirations for its diverse student body. Meeting any one of these satisfies the basis to be nominated for an honorary doctorate. Greenlaw “Fritz” Grupe and his wife, Phyllis Anne Grupe, encompass all three. On Jan. 26, the CSU Board of Trustees approved the request of Stanislaus State President Joseph F. Sheley to award honorary Doctor of Humane Letters degrees to Fritz and Phyllis Grupe. The doctorates will be awarded during commencement ceremonies on May 27. The Grupes, lifelong residents of San Joaquin County and cornerstones of the greater Stockton community, were stunned and excited to receive the news. The honorary degree will hold a special significance for Phyllis Grupe. While Fritz Grupe has a degree from UC Berkeley, Phyllis left UC Davis after two years, just months after the two were married. Fritz Grupe, a Linden native and the son of a developer and farmer, has overcome dyslexia to become a highly successful businessman who cares about his community in ways that promote individual success and regional accomplishment. He founded and is chairperson of The Grupe Company, one of the largest, privately held real estate companies in the United States. The company has created 12 master-planned communities and 50,000 homes in 35 cities spanning six states. Grupe Commercial's direct involvement with Stanislaus State is significant. As the master developer of University Park in Stockton, the company has worked to build and manage the Stanislaus State Stockton Center as a mixture of college classroom facilities, as well as the offices, health-service facilities, retail buildings, high school and community center that are also part of the park. The University Park project is achieving its goal to redevelop a highly challenged part of Stockton and to preserve some of the city's most historic properties. Without Grupe Commercial’s role as developer of the site, it’s very possible the CSU would not have a direct presence in Stockton. But decades before University Park and the Stockton Center, if working the Grupe family farm had been more lucrative for the young married couple, it is very likely they would not have been in a position to make such a positive impact on San Joaquin County and the region. Upon getting married, the newlyweds moved back to Linden to start a family and build a life on the land emblazoned with the Grupe name since 1849, when Fritz’s great-grandfather John Carsten-Grupe arrived in the area. In 1961 they discovered the farm would not support their young family, so Fritz Grupe begrudgingly moved into the city, taking a job with Sims and Grupe Real Estate, the broker selling properties for Village Homes. Even that wasn’t easy, and when the project developed financial troubles in 1965, Fritz saw an opportunity and made a deal with a local bank to take over 33 lots and 12 unsold homes. That’s how the young man who dreamed of being a farmer and rancher with a goal of making $10,000 a year found his new calling. Right away, the company found a dual focus, as both Fritz and Phyllis saw a pathway to success through fostering a family atmosphere in the company. They began that philosophy in their own relationship, with Phyllis doing much of the interior design on their early homes. To this day, their business organization reflects the commitment to family. All four of their children — son Mark Grupe and daughters Sandy Huber, Bonner Murphy and Michelle Jaques — hold key positions within the company. Other employees might as well be considered family, according to Dan Keyser, senior vice president for Grupe Commercial. The young Grupe Company found a niche selling homes to young people, and early success led to the development of new areas of Stockton, notably the underutilized area west of what was then the West Side Freeway. By 1979, those underdeveloped lowlands would be bustling with the completion of Interstate 5 through Stockton. Those Grupe communities included Lincoln Village West, which started in 1965, Quail Lakes and Brookside, the company’s final master-planned community in Stockton, which included the city’s first new private country club in 29 years. Grupe developments have featured innovations that have become popular throughout the country, including buried utility lines and pre-wired television cable systems. Grupe also was one of the first companies to include lakes, docks and boat slips in upscale communities as a way of keeping nature a part of everyday life, and the company’s signature methods of seamlessly integrating homes, apartments, parks and schools into master plans has been much-copied. All of the innovations can be traced to a concept very important to Fritz and Phyllis Grupe: quality of life. And once The Grupe Company was established and flourishing, they turned their sights to addressing community issues affecting all people, not only the ones living within Grupe developments. The Grupes are unabashed fans of the region. Fritz was one of the business leaders who in 2012 launched Stockton Forward, a coalition committed to the city's growth. In 2005, he was named by Gov. Arnold Schwarzenegger as co-chair of the California Partnership for the San Joaquin Valley. He founded the San Joaquin County Business Council, served as president of the Stockton Chamber of Commerce and the Board of Realtors, and was chapter chairperson and national university chair for the Young Presidents Organization. He served on President George H.W. Bush's Special Commission on Regulatory Barriers to Affordable Housing. 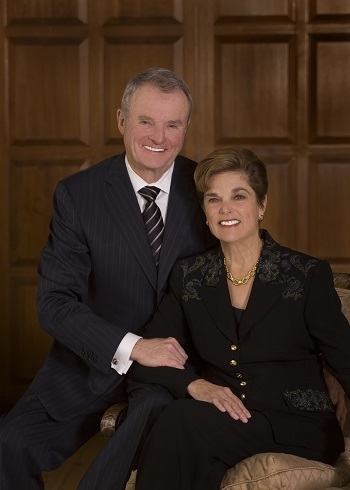 In the area of higher education, he has complemented his work on the Stockton Center with service as a regent of the University of the Pacific and as the founding chairman of UC Merced's foundation board of trustees. He also has been instrumental in bringing together experts, business leaders, organizations and agencies throughout the state to help develop a plan to address California's recurring water problems. The majority of Phyllis Grupe’s civic work centers on helping children succeed. She was among the founders in 1998 and currently is chairperson of the Community Partnership for Families of San Joaquin. She also was a founding member in 1997 of San Joaquin A+, a nonprofit that supports literacy. In 1989 she created the national Project for Excellence in Public Education, which develops private sector funding for public education programs, and the related Grupe Foundation for Excellence in Public Education. She is a past board member of the Children's Home of Stockton and a member of the Urban Land Institute and of the World Presidents Organization. The Grupe family eventually established their own farm and now own cattle and horse ranches in several locations. The family’s farming operations produce olives, cherries, grapes, walnuts and apples for domestic and global markets. They maintain a walnut orchard in Linden and a cattle ranch in the Yosemite region, but their home is Shady Oaks Ranch, a 1,300-acre spread west of Lodi. It includes an equestrian center, which allows the Grupes to pursue their hobby and second passion, the equestrian sport of combined driving. Together they won the 2005 United States Equestrian Federation's National Pairs Championship. Four years later, Fritz placed first in the advanced single-horse division, making him the only driver to have claimed both titles. Fritz was a member of the U.S. National Equestrian Team that competed in the 2005 World Equestrian Games in Salzburg, Austria. And now, twin honorary doctorates will be bestowed on these two lives lived in full. When asked what the honor means to them, Phyllis Grupe instead offered a hope for what it might mean to the people of Stockton.